I talk a lot about embodiment and disembodiment at work. We’ve just finished the chunk of the course that looks at the body’s reaction to trauma – the physiological shifts and changes that take place in the nervous system as well as psychological defense mechanisms which aim to protect a person from the pain but ultimately lead to comprise in other areas. I talk about the way that meditation is frequently misunderstood and unfortunately taught: that meditation is about emptying the mind and not feeling. This is not the case, and many clients I work with realize that the meditation they have been practising is a substitute for their drug of choice and becomes just another way to disconnect and disembody and not feel. Meditation simply means having a single point of focus and being present and attuned to whatever is arising but not grasping on to it. So whether that’s sitting and focusing solely on the breath, being completely focused on cleaning the toilet, or being utterly captivated and engrossed and aware of every single wonderful sensation arising in you as you eat that incredible chocolate, that is meditation. Yoga can be a meditative experience but that element can often be missed, particularly in something like Ashtanga which requires spinning the plates of ujayyi breathing, the technicalities of the poses, the transitions, the gaze points (the drishti) and those all important but often elusive bandhas… the problem can instead become one of having too many points to focus on. I would still say that focusing on all of the above requires a great deal of concentration and still involves being present (particularly in balancing poses where a lapse in concentration can mean a bump on the head) but I think it is sometimes useful to play with having just one point of focus within your practice. It’s useful to set this anchor prior to starting, and if you notice that you’ve lost sight of it, become aware that you have and keep coming back. I sometimes have as my point of focus my breath – and will aim to maintain a constant, steady breath (with the inhales the same quality and length as the exhales) throughout, particularly when the poses get challenging (karandavasana followed by mayurasana followed by nakrasana anyone? I still maintain that this is just a cruel joke made up by a young Pattabhi Jois). When I’m choosing to focus solely on the breath, I care less about how graceful or strong my practice is (it’s often better simply as a by product) and I notice where my breath drops or is strained which I may not have done otherwise. I’ve also practiced wearing earplugs which leads to an incredible, gentle roar throughout as the breath is magnified in the ears. I did something similar the first time I ever scuba dived, mesmerized by the sound and sensation of this amplified breath and the sound of the bubbles escaping all around my mouthpiece. What I didn’t realize is that it made me use up my oxygen tank stupidly quickly causing me to have to cut short my first ever dive. Dammit. At other times, I focus completely on maintaining bandha throughout… or keeping my shoulders and lats engaged, or aiming to be as smooth and graceful as possible which requires a surprising amount of laser-like attention and precision. Give it a go. In other news, Debbie and I have begun the hunt for a location for our retreat next year. We’re thinking beach. Preferably pristine white sand, crystal clear, turquoise seas and as breath taking as possible. 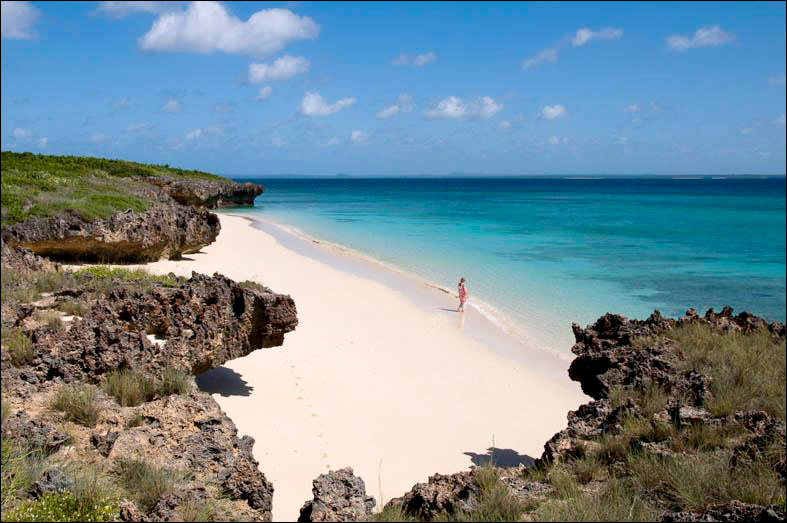 This beach is in the short list… Watch this space.